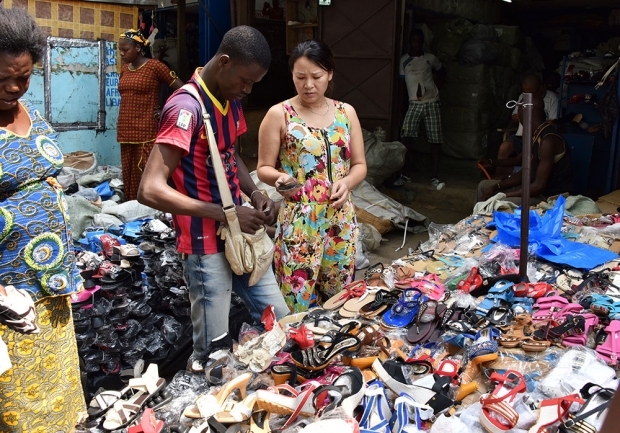 A saleswoman and customers at a market in the Adjamene neighborhood of Abidjan, Côte d'Ivoire. The SoundCloud content at https://soundcloud.com/chinatalkingpoints/who-are-the-chinese-in-africa- is not available, or it is set to private. Some say the number of Chinese in Africa now exceeds one million people; some even go as high as two million. Although no one has a precise accounting of just how many Chinese migrants now live on the continent, there is no doubt their numbers are large and growing. This week, we speak with Dr. Yoon Jung Park, one of the world's foremost experts on Chinese migration, to find out who the Chinese in Africa are and what effects their integration is having on African societies.